"The first thing we?re going to do is examine the spacecraftvery, very closely," SpaceX CEO Elon Musk ? who also co-founded the onlinepayment system PayPal ? said in a post-mission news briefing Wednesday. "We?regoing to do deep forensics on it to see, did anything break? Is there any placewe should be, perhaps, strengthening?" The success also has company officials targeting evenloftier goals in the future. Musk announced after the flight that SpaceX willeventually equip Dragon with thrusters that would enable it to land on aplanet's surface and lift off again. This week's demonstration wasSpaceX?s first test flight under NASA?s Commercial Orbital TransportationServices (COTS) program, which is aimed at boosting privatesector development of vehicles to carry crew and cargo to the InternationalSpace Station. SpaceX first teamed up with NASA under the COTS program in2006, and the agreement requires the commercial provider to fly threedemonstration flights with the Dragon spacecraft. Each flight will involveprogressively more complex objectives, culminating in the third flight, whichwould see the Dragon capsule flying to and berthing with the space station. With the success of SpaceX?sfirst demonstration flight, however, Musk and other SpaceX officials are consideringadvancing the COTS timeline by combining the mission objectives of the secondand third planned flights. Musk was confident that, with NASA's approval, the Dragonspacecraft could fly directly to the space station on its next test flight,which he imagined could occur as early as mid-2011. In the initial schedulingagreement, Musk said, NASA officials agreed to consider allowing SpaceX to flyDragon to the space station on only its second flight if the first wentaccording to plan. "There's no meaningful difference in the complexity betweenthe maneuvers we conducted today, and what we would conduct in going to thespace station," Musk said. "Of course, we need to carefully examine the datafrom this mission and make sure it's all good, but I'm optimistic that the nextflight will be to the space station." But first, SpaceX would need to incorporate some extraelements into the Dragon capsule before it can fly to the station. Thisincludes the addition of solar panels and improvements in redundancy for someonboard electronics, Musk said. "There won't really be any changes to the structure orengines," he explained. "So, it's a relatively small delta between this vehicleand the one that would go to the station. That's why I feel really confidentwe'll be able to get there." The decision will ultimately be made by NASA, but AlanLindenmoyer, program manager of NASA's Commercial Crew and Cargo Program, said SpaceX'sdemonstrable successes so far with its Falcon 9 rocket and Dragon capsule willbe factored into the scheduling process. "Certainly after today, we have increased confidence inSpaceX systems," Lindenmoyer said. "We have very specific objectives laid outfor the next mission, as well as the third mission. It was always planned to beincremental and increasing in complexity. "I would say, we will consider the proposals that SpaceXprovides," he added. "We will assess the possibility and the feasibility andmake sure it's technically possible with the equipment that's planned to beavailable in that timeframe. We'll certainly give it a good consideration." The reverberations from this week's landmark test flight arestill being felt throughout the spaceflight community. Early praisefor the accomplishment poured in from those inside and outside the commercialsector. The Space Frontier Foundation called the flight "historic,"and said SpaceX's efforts are changing the game for the future of spaceflight. "NASA is right to celebrate this achievement, as it furtherproves that their bet on commercial industry as their new partners is going topay off," said William Watson, foundation executive director. "Americancompanies can do amazing things when government offers them the chance toperform, rather than trying to compete with them." NASA and SpaceX officials shared the same sentiment, withboth parties agreeing that one of the main triumphs of Dragon's success was thedemonstration of a flourishing partnership between the public and privatesector. "I talked about this being an experiment ? 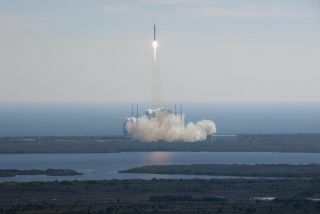 a new way ofdoing business with NASA and the private industry," Lindenmoyer said. "I wouldsay, this is an indication that this experiment is working." Furthermore, Musk hopes that NASA's continued collaborationwith commercial providers will leave a lasting legacy for the agency and thefuture of the country's spaceflight program. "One of the best analogies for the COTS program is the airmailprogram back in the day," Musk said. "It was a huge boost, and really got the Americanaviation industry going. It resulted in just an explosion of innovation and bigimprovements in technology and operational capability. I think the COTSprogram, historically, will be seen in a very similar light."